Impossible dialogue, pursuit, the faces join and part through 3 screens. To the left, variant on a single screen. les visages parlent et dessinent un décor, interaction avec la parole, et la main. Application de notre "Palette d'animations" à base de "Z-Buffer". Faces speak while drawing a picture. interaction with the mouse, and speech. Application of our "Palette d'animations" based on the Z-Buffer. 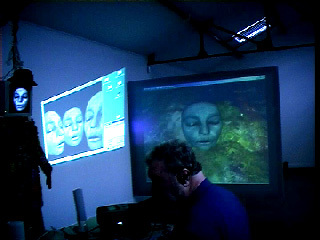 This installation, presented in 2001, produces a real-time image on the central screen from the 3D brushes that are speaking faces. Used as a tool of creation by one person (here Hervé Huitric), it plays on the mixture of verbal echos and constructions or destructions of the image. The words are only echos of those pronounced during the manipulations.